Posted May 31, 2011 by Dr. Jason Hare & filed under Uncategorized. Not the preferred method of holding your baby. As new parents, we do everthing we can to give our children the best start in life. But did you know that the way we carry our children can have a profound impact on their health? It’s true. It is well established that some carrying methods have very real health risks. Plagiocephaly: All parents are familiar with the baby travel systems. With these systems, the baby is strapped into a plastic basket. This basket can then be secured into a car seat base or a stroller. Because of their convenience, the baby is often kept in the hard basket for long periods of time. The problem with this is that your baby’s skull bones are soft and if you little one spends too long laying on their back it can actually flatten and deform the shape of their head. This is known as plagiocephaly. You can find an example image of it here. It should be noted that research has shown these “flat head syndrome” babies have been shown to have lowered cognitive skills and motor function. There’s nothing wrong with these travel systems. In fact, I used them when our children were little. But avoid keeping them in the carrier basket for prolonged periods. If you’re not in the car, consider a different method for carrying your child. More on that in a bit. Hip Dysplasia: This condition used to be known as congenital hip dislocation. What happens with hip dysplasia is that the socket of the ball and socket joint is too shallow and this allows the femur (thighbone) to easily dislocate. What do we as parents do that makes this condition more likely? Swaddling. When we swaddle a baby, their legs are usually tightly bound and straight. In this position the ball and socket joint is not encouraged to properly form. In fact, studies with Navajo indians show that they suffer a much higher incidence of hip dysplasia than the average population. This is because the Navajos often use papooses which hold the legs in a tightly bound extended position. To avoid this, don’t swaddle the legs tightly. Keep them loose. Yes, I know this goes against what you were taught by the nurses at the hospital, or perhaps in some baby book. Sometimes, old advice lingers long past it’s expiry. Don’t take my word on it. Do your own reseach. You’ll find what I say to be true. If you can avoid unnecessary corrective hip surgery, wouldn’t you do it? So how should our babies’ hips be positioned when we carry them? The hip should be flexed at 100 degrees (knees slightly closer to the head than the hips) with the knees lightly turned out. Some people call it the frog position. This position holds the femur deep in the socket joint, encouraging a nice deep cup to develop. Babies tend to naturally wrap their legs around our bodies with their knees high and dig in with their toes when we carry them. Nature knows best. Spondylolysis: This is where the vertebrae, typically in the lower back, break into two pieces. This is normally due to a repetitive stress that slowly breaks down the bone, also known as a stress fracture. It can be a very painful condition and the baby will have it for life. The two pieces of bone may drift apart and can even require surgical correction in some individuals. Looking at native Eskimo populations, the rate of spondylolysis is very high (up to 60% of the population). It is thought that this is a result of the way their babies are carried. 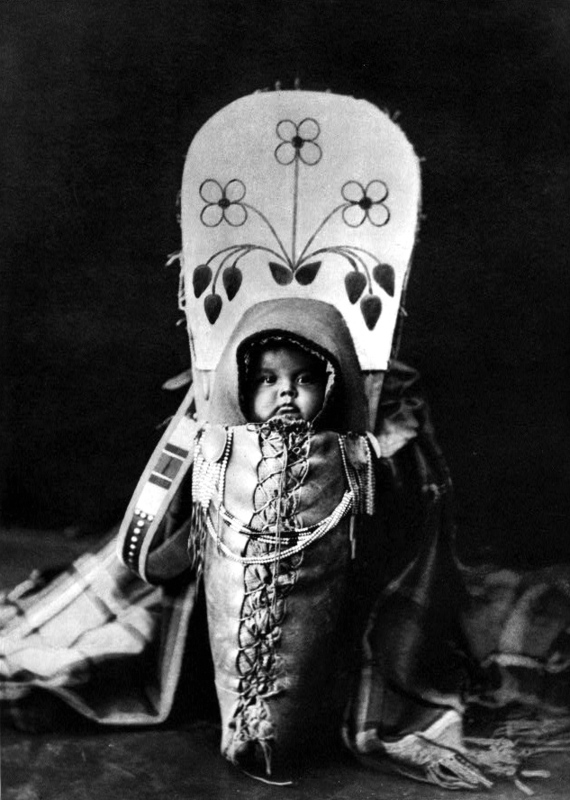 The traditional method involves holding the baby against a hard wooden backing. This forces the spine into a weight bearing position before the baby has the muscular support to so on his/her own. As the result, the muscles don’t protect the spine and the physical stresses can break down the spine. So how should we carry our children, other than in our arms? The way I like to see babies carried is through baby wearing, which is carrying you little one is held to your body by a soft fabric carrier. These can be slings, wraps or mei tais. I’d encourage you to look at each option and choose the one that you like best. Keeps the hips in the postion that encourages socket development. Gives a soft support for the head to prevent plagiocephaly . Keeps the lower spine supported to prevent spondylolysis. Avoid the use of jumping chairs that attach to the door frame. This forces the babies spine to be in weight bearing position before it may be ready. Avoid carrying your baby in the outward facing position. Facing in holds the hips in a better position and allows the baby to keep their neck in a good position while sleeping. Ensure that your carrier doesn’t let the legs just dangle down. Aside from just being uncomfortable, it does nothing to ensure proper hip development. If you notice hip clicking, leg length differences or uneven skin folds in the legs, be sure to have you baby evaluated for hip dysplasia by your family gp or chiropractor. Often, hip dysplasia is missed by the family doctor and caught by the parents. I hope this article helped. If you have any questions about your childs development or would like us to check their spine and hip health, give us a call in our clinic: Pure Chiropractic, Nanaimo, 250-585-8866. If you’d like the latest in health news, why not “like” us on Facebook. My second daughter had an extra fold in her left leg and I remember the nurse or the doctor mentioning it at a check up. Thankfully she doesn’t seem to have any hip problems now. Thanks for your comment, Tasha! Glad to hear your daughter was fine. Dealing with hip dysplasia is not fun for the baby or the parents. It can end up being years of surgery and body casts and lead to early degeneration of the hip joint. Always get you little one checked if you have any concerns! No problem Karyn-grace! This is a subject that I am quite passionate about. My daughter had hip dysplasia which had a very long and difficult resolution. If I can help just one family I’m happy. I’m sure that as a lactation consultant, these are conditions that you have to be aware of. Thanks again for your comment! Great article. Mind if I share it? Of course not Gary! It’s written to hopefully save children (and parents) of having to go through a horrible ordeal. There’s a lot of fabric carriers that do a great job of keeping your baby in the froggy position and prevent the legs from dangling down. Check out a sling, wrap or mei tai. A good hip position is especially important for younger babies (six months or less), but if your little ones are toddlers it is less of a health issue and more of simply a comfort issue. Fabric carriers are also excellent for bonding and feeding. I recommend exclussive inward facing for the first 6 months. After this, if he/she is outward facing be sure to do as you are currently, and not let them sleep in the outward position. thanks (: my carriers are all fabric ones/soft carriers. After reading this I was worried, but the ones I use do keep his legs ‘froggy’. I’ll think twice about putting him outward facing for now, he is not quite 6 months, but has such excellent head control and can almost sit on his own. Also, maybe you will know, is how he sits a problem for backs/hips at a later time in life? I use a Bumbo seat for him as well, will this potentially cause problems? Great questions, Melissa. I’d only use the Bumbo for short periods of time as they are hard backed and force the spine into weight bearing too early in life. I’m of the opinion that if the little one can’t yet sit up, we shouldn’t force it upon them. If they are sitting up on their own and their muscles get too tired, they simply fall over (put some cushions around! ), but in the bumbo they’ll stay proped up long after their muscles have given up supporting them. I wouldn’t use them with mine. An great read, and something I’m very passionate about. We have a child who suffers from Plagiocephaly, and it’s worrying how easy this can happen to a baby. Luckily, we found the Steeper Clinic. The process has been long, but now our son’s head has rounded and he looks great! I love my baby sling as it allowed me to carry my baby in a cradle position while he was an infant. As he grew older I was able to carry him on my hip the way I would naturally hold him! I love how you mentioned that above! Great inexpensive and cute options at Mod Mum Baby Slings. I am presently recovering from a total hip replacement due to undetected dysplasia, this is no fun 🙁 I am also a passionate baby wearer and will be sharing your article in the hope that other babies don’t end up where I am today, we use woven wraps and mei tais to ensure optimal support knee to knee for our babies. Yes, the ergo baby carrier is the appropriate choice for safe babywearing. It does not let the hips dangle, nor does it place force on the spine/pelvic bowl. Other similar options include the pikkolo, beco and mei tai baby carriers. Thank you for this article! My daughter was born with hip displacia and I was blessed to have a cloth diaper lady who also knew carriers and was able to get us set up with proper carriers and diapering techniques prior to her being put in her brace. I am a huge proper babywearing advocate! What a great article! Could I possibly ask your opinion on sitting up as such? I see you mentioned “I’m of the opinion that if the little one can’t yet sit up, we shouldn’t force it upon them. If they are sitting up on their own and their muscles get too tired, they simply fall over…” but does that mean that the child should sit up by himself from the lying flat position or is it that the child would be able to sit by himself when sit up by someone else? Reason I ask, is our little one is just gone 3 months and loves being upright, be it in our arms, or sitting/being bounced on one knee. And while lying on the back, she loves to grab a hold of the fingers and being sit up… – are we wrong to encourage her so early? Her hips are great now. She’s almost 4 and we just got cleared by the orthopedic to never come back! She was in the pavlic for almost 6 months and almost needed a cast, but improved enough to just be watched closely. She also ended up in a dennis brown bar for being pidgeon toed at 18 months. Through some at home “physical therapy” (just things the ortho had us doing) she finally improved enough to be cleared! We were told to double diaper, but our cloth diapers were thick enough to use instead. @Natalia Great question. What you’re doing is fine. Don’t worry, our babies aren’t that delicate. In fact, they’re pretty tough. Being sat up for a short period of time is no big deal, it’s more about not being forced into a sitting position for prolonged positions. Hope that helps! Oh my that picture is shocking. I have seen people throw babies in the air before, now with my own family I am happy that I can take care of my kids instead of a nanny. I wouldnt have been able to do this if I still worked as a clerk, now I have my own home business selling import and export goods online, I can make sure my kids are safely handled. Do you recommend the use of exersaucers for babies that can’t sit up yet? Glad you liked the article. They’re fine for short periods of time. We shouldn’t keep our little ones’ spines weight bearing for long periods before the muscles have developed enough to support. hope that helps! My son is two and a half mo old and his dr said his hips click. She said she wasn’t going to do a brace just yet but will check to see if the click at his next scheduled visits. I feel like now is the time to try anything we can before we are told he needs a brace. We have a mei tai and have bumgenius cloth diapers. Should I double them? What were the negatives of doubling cloth diapers like the bum genius. What about having him sleep frog like on me at night? That seems like the perfect position. Just for the next two months even. Also what about putting a rolled up towel between his legs in carseat or bouncer to keep them wide. Isn’t that the goal? With a newborn, a certain number of children will see their clicking go away all on their own. But to be ho set, at 2 months it is much more likely that you have a problem. Double diapering has been found to increase avascular necrosis, where the blood supply to the bone is compromised and the bone begins to die. Once hip displasia is diagnosed the first treatment should be a Pavlik harness (you little one may well need an xray). The harness should only be taken off for diaper changes. If I were you, be more insistent with your doctor. You are absolutely right that now is the time. Research has shown that delay of proper treatment means a less favorable income. Ask your doctor for a referral to an orthopedic surgeon, preferably a pediatric orthopedist. The Oavlik harness is what you need now. Ps keep me posted. I’m happy to guide you through this. Went to our doctor today and she said his hips click but he does not have hip dysphasia. She said she can feel a ligament clicking but the bone does not pop out of the socket. She said she would be happy to get an ultrasound to confirm. So we are. So she said no brace unless ultrasound shows hip dysplasia. And to treat him normal. It may be a ligament, but you really want to be sure. The ultrasound should be able to rule out hip dysplasia. Let me know how it goes. Also, pay attention to see if you notice a click at any time. It often happens when you change the diaper as you are holding the hip in a position that makes the click more likely. It’s worth noting that when babies cry it can give a false negative (it appears that there is no hip dysplasia when in fact there is) as the bay will tighten his/her muscles and hold the hip more tightly. This is true. Babies’ bones are responsive to subtle shaping. Carrying them in particular ways could affect their bone formation permanently. My chiropractor Brisbane advised me of this. Thanks for sharing, though, there’s no one particular type of sling that’s best for all babies and parents, and there is no particular way to position a baby. I have been using the baby bjorn carrier and am concerned this could cause her hip to be become displaced? Is this correct? My son’s head is slightly asymmetrical, being more square on the right, flat on the left, and with a high crown. If you look at his head from the top, His forehead is slightly more forward on his left side, and the crown protrudes slightly more on the right side. It’s all very slight. He’s almost 13 weeks, and tends to sleep a lot. When he was born, we were told to keep him on his back to sleep in order to prevent SIDS and to hold him upright or on his left side after eating because he had reflux. For the lst 4 weeks, when I’m awake, I alternate his napping positions between the prone position with knees tucked and his right side. It’s improved a little, but I’m still concerned. When I’m eating or working or otherwise can’t hold him, he sits in a baby rocking chair (http://www.fisher-price.com/en_US/products/47989) or has tummy time in his Pack ‘n Play. He hates being held in the Infantino Union Ergonomic carrier (http://www.infantino.com/product.cfm?product_id=1356). He can’t sit up unassisted yet, but loves to sit with my hands holding him upright. Should I not hod him sitting for long? What else can I do to help his skull to even out? Is this going to cause developmental problems? He also prefers to look to the left, so when he’s on his back, he sleeps with his head turned to the left even if we try to encourage him to switch. Is it bad to carry you child on ur side waist? Like u would carry a monkey! Would this carrying style make ur baby bowleg? Carrying then on ur side with both legs in front of u? Carrying ur baby on ur waist & hip with one leg in front of u and one in the back of u? I think youve produced some actually interesting points. Not as well many people would basically think about this the way you just did. Im truly impressed that theres so very much about this subject thats been uncovered and you did it so properly, with so substantially class . Good 1 you, man! Truly good stuff right here. Most of us were introduced to chiropractic care when we were adults – and we had to play catch-up for however long a period of time before we really began to feel healthy again. If we began chiropractic care as a younger adult, it probably didn’t take too long to restore good health. If we were older – well, the process probably took more time. If chiropractic care is valuable for you, imagine how valuable it is for your children. Kids are natural explorers – they run, jump, climb things, fall down, and bounce around.1 And, kids are resilient – this ability to recover quickly is one of the great benefits of being very young.